St Saviour’s Church, Pimlico celebrates their 150th anniversary in conjunction with SouthWestFest’s 10th Anniversary in a special exhibition of contemporary art from students of the MA Fine Art programme at nearby Chelsea College of Arts. 12 artists engage with this gem of Victorian architecture, filling the auditorium with new ideas where ‘Collaborationem’ is more than just working alongside one another; this group show is also about sharing, community and participation. From 3rd to 6th July 2014. Through performance, installation and film work along with the more traditional mediums of sculpture, paintings and photography, 12 makers place art directly within the heart of the building, in a variety of creative expressions that offer insights into identity, ritual and memory. Not only a place of worship and prayer, churches also serve as significant and meaningful community spaces; visitors to St Saviour’s for SouthWestFest and ‘Collaborationem’ are invited to observe, discuss, participate or simply engage in personal reflection as they explore the artwork placed around the church. While visiting the exhibition, it’s worth an extra moment or two to pause and admire the hall which splendidly embraces the artwork within. Like many buildings of its kind in the “Decorated Gothic” style that was popular in the Victorian era, St Saviours is itself a work of art with ornamental marble fonts, 19th century stained glass windows and richly-carved oak throughout. As visitors walk around, some may feel that a house of worship is a rather unconventional site for artists to come together; perhaps it’s not so unusual to think of it this way: temples, churches, synagogues and mosques have for centuries been the purveyors of sublime works crafted by skilled makers, all before the word “art” defined any of these objects. Then and now, this uniquely human endeavour of making things, often with no other discernible purpose than being, these are the things which somehow reach inside a person and touch the soul, making a church an absolutely right place for art. 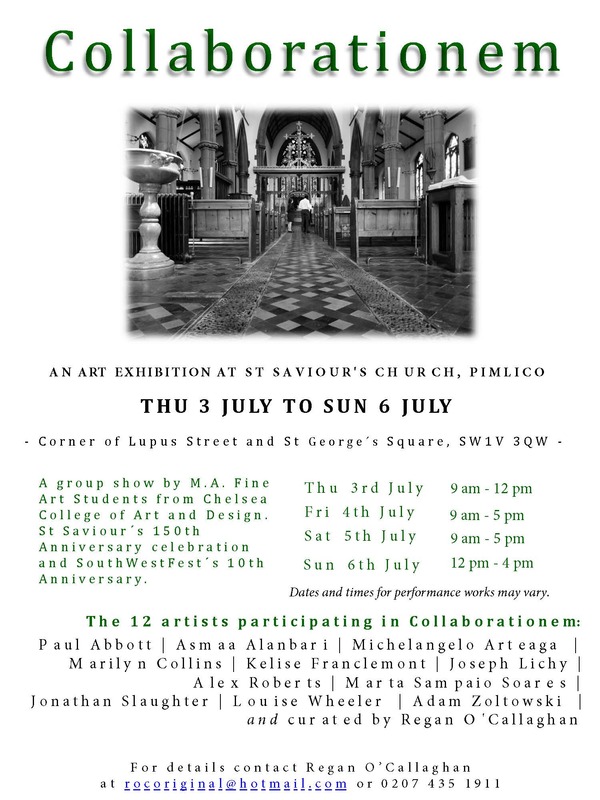 If you’re in Pimlico on the weekend of 3-6 July 2014, for SouthWestFest or otherwise, don’t miss this exhibition at St Saviour’s! ‘Collaborationem’ is on at St Saviour’s Church, Corner of Lupus Street and Saint George’s Square, Pimlico, London, SW1V 3QW from Thursday 3rd of July through 6th July 2014. Dates and times for performance works may vary.